In the next few weeks there will be several opportunities to sample Washington State Wine and Cider from the Olympic Peninsula. Toast the arrival of autumn with Washington Wines and Ciders from the Olympic Peninsula. If you love the taste of lamb, you’ll love the third annual American Lamb Jam in Seattle. Enjoy lamb prepared in a variety of ways by 20 of the top chefs in Seattle. Camaraderie Cellars, a Port Angeles, Washington Winery, will pour their wines at the event. Please see Seattle Lamb Jam and Camaraderie Cellars for more information. The Olympic Peninsula boasts many small farms and is a leader in the Farms-to-Table movement that is sweeping the country. Sample their fresh fare and a selection of wines from our Olympic Peninsula Wineries on Nomember 5, 2011 at the Elks Ballroom in Port Angeles. Live music, a silent auction, and an art exhibit round out the event. The Taste of the Peninsula benefits the YMCS of Clallam County. More information is available at A Taste of the Peninsula. Our Olympic Peninsula Wineries join together each fall to celebrate the harvest. 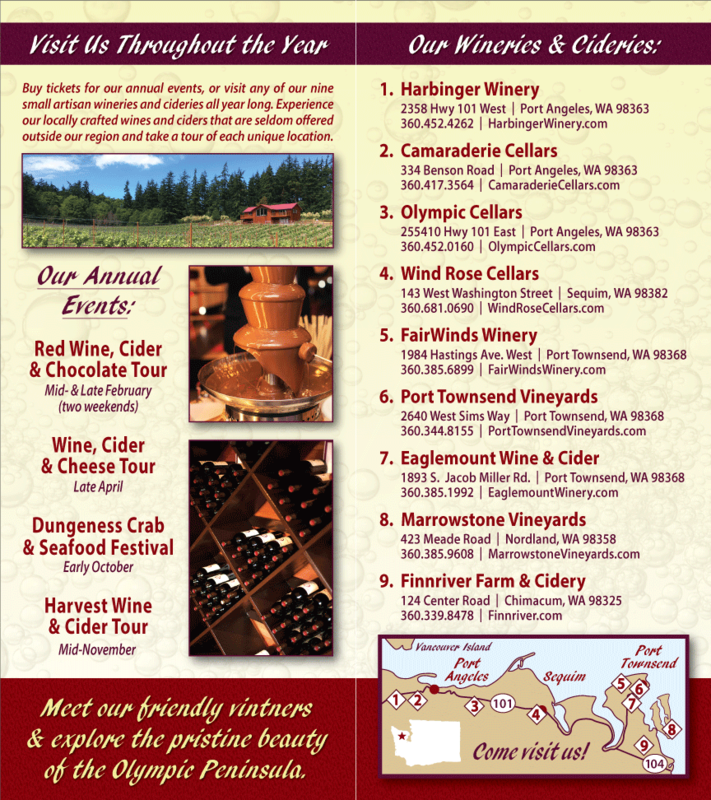 We invite the public to visit our wineries on the Olympic Peninsula for a Harvest Winery Tour, November 11, 12, and 13, 2011. Guests will sample Washington wines and ciders and enjoy a variety of appetizers inspired by the fall harvest. Additional information is available at Harvest Wine Tour.